New Delhi, April 5: Over the years, the Indian Premier League (IPL) has seen home teams preparing wickets to suit their strength. But Delhi Capitals' request for wickets with grass has not been met by the Delhi and District Cricket Association (DDCA). In fact, even as head coach Ricky Ponting made his displeasure known after DC lost to Sunrisers Hyderabad on Thursday, the DDCA has made it clear that it is impossible to provide pitches that will have grass at this stage of the season. While Ponting said that it was the 'worst wicket' DC had played on - after the five-wicket loss to SRH - team advisor Sourav Ganguly personally met curator Ankit Datta and spoke to him for good 20 minutes. After Delhi Capitals' One-Sided Defeat Against Sunrisers Hyderabad, Angry DC Coach Ricky Ponting Slams Feroz Shah Kotla Track. 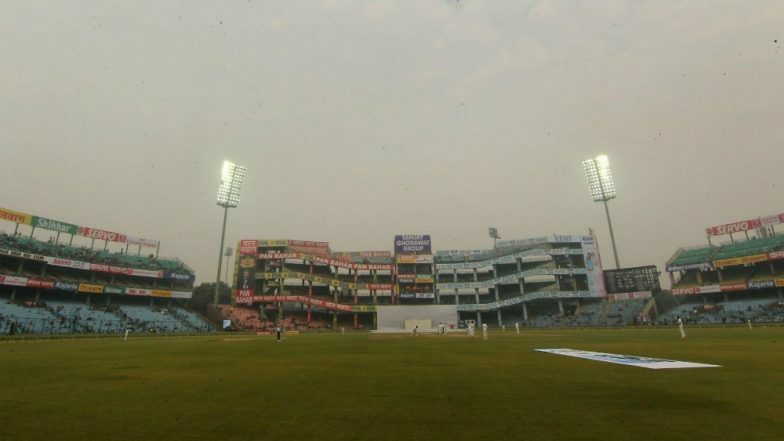 Even though both Ganguly and the curator weren't available for comment on their interaction post the game on Thursday, a senior DDCA official revealed that the team management wanted to discuss the kind of pitches that the home team would like to play on in their remaining home games. Delhi still have four games to go at the Ferozeshah Kotla. Speaking to IANS, the DDCA official said that though discussions have taken place about DC wanting some grass on the wicket, but considering the number of matches that have been played on Kotla this season, it is impossible for the wicket to sport grass. "The franchise has been asking for grass and a bit of pace on the wicket, but to be honest, it is just not possible. We have made this clear to them from the word go. At the fag end of the season, you cannot expect pace and bounce on the wickets. Even the practice wickets are slow and that gives them the perfect feel going into the game. We have tried to keep them as close to match conditions as possible." "We have had the Vijay Hazare Trophy here, the Deodhar Trophy here. After that the Ranji Trophy was played. We have just one ground here, so considering the amount of cricket that has been played on the square, it will be unfair on the groundsmen to ask for pitches with grass. But, there will be a two-week break now and there will be a certain amount of recovery and the wickets will definitely play a little better in the last four games. But this will still remain on the slower side and growing grass on the wickets now is just not possible," he explained. Delhi have failed to drive home the advantage at the Kotla. While they lost their first home game to Chennai Super Kings by six wickets, their next game against Kolkata Knight Riders ended in a tie before Kagiso Rabada won DC the game in the Super Over. And again in Thursday's clash, the SRH bowlers made much better use of the wicket than the DC bowlers. Even the batsmen struggled to adjust to the slow nature of the wicket. While Ponting has made his displeasure known, he has also asked the team to try and adapt to the conditions on offer. "At the end of the day it is the same pitch for both teams. But, if you ask me would I want to play Sunrisers on that type of pitch, that wicket absolutely suits them down to the ground. But if the wickets are going to be like this, we need to think about our selection as well. " "The shot selections did cost us right from the start. I don't think Prithvi Shaw played a great shot considering how low the ball was bouncing. Some of our other senior players probably didn't bat long into the innings either. One-thirty was short of what we were expecting. Even on a slow wicket, we expect our batting group to get 160-165 when we bat first. We need to talk about that and find a solution," he said.